Soldier Honored: Ramon A. Villatoro Jr.
Made the PING All-West Region team and All-WCC first team as a sophomore ... Was the WCC Championships medalist ... Ranked #79 by Golfweek/Sagarin and #119 by Golfstat ... Posted a 71.74 scoring average, #8 on the Waves’ single-season list ... Had 18 below-par rounds, seventh on the Waves’ single-season list ... 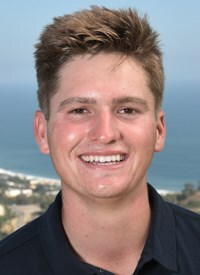 Played in 13 tournaments and 38 rounds, with five top 10s and six top 20s ... First career victory was at the Prestige at PGA West with a 7-under 135 (69-66) ... Later won the WCC Championships with a 14-under 202 (70-69-63) ... Tied the Pepperdine record and set a WCC Championships with a 9-under 63 ... The 14-under also established a Pepperdine record for 54 holes at the WCC Championships, and tied the fourth-best score overall ... Won the WCCs by eight shots ... Had five top-six finishes in the spring, which also included a tie for third at the Southern Highlands Collegiate with a 5-under 211 (68-72-71) ... Led, or shared the team lead, at four tournaments ... Had at least one below-par round at 11 of 13 tournaments, and multiple below-par rounds six times ... Tied for 29th at the NCAA Norman Regional (73-71-74=218) ... WCC Player of the Month for February and April.